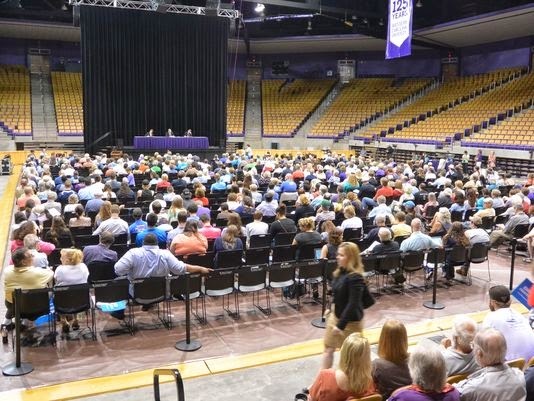 A very large crowd came out against fracking at Western Carolina University. But, naturally, the members of the General Assembly had plugs in their ears and gas corporation money in their pockets. If voters want to be heard, they need to loudly, clearly and without question vote out NCGOP this fall. Given the tone-deaf nature of the NCGOP officials, this is really the only way to get them to hear us. As long as most people get their "news" from Fox News, there is little likelihood of people learning what is actually going on. From the local media, which continually gives the right-wing criminals who are running this county, the board of elections, etc. a pass, to the big-city TV stations who stand with McCrory, Art Pope and Franklin Graham and their cronies and disciples(J. Jordan, D. Soucek, for example), to the corporate, national media that delivers right-wing platitudes as fact, there's not much hope for an informed public.